Every so often a job comes along that reminds me why I wanted to become a photographer in the first place, this is one of those jobs. I love to meet extraordinary people and spend a day in their life, to connect with them and try to understand their point of view. Then tell their story in an authentic way, with integrity through my medium. As a father of two it's beyond my comprehension how difficult it would be to lose a child. 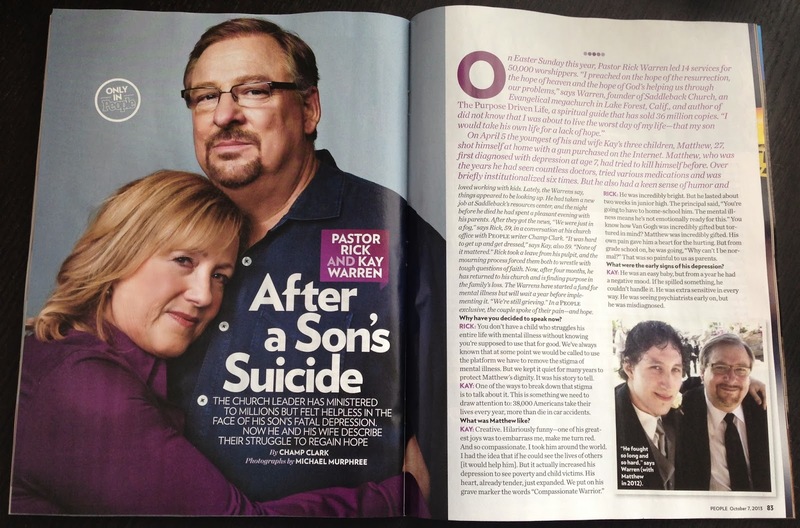 As painful as I'm sure it must have been, Pastor Rick Warren and his wife Kay Warren gave me a gift and a gift to anyone who sees these images and reads the story. Ultimately I hope their willingness to be vulnerable will help shed light on the stigma of Mental illness. On a personal note, they are really fantastic people and I was really moved by them. I hope our paths will cross again sometime in the future.